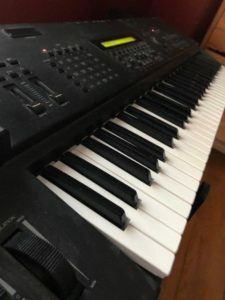 “You can read lots of stuff about this synth online, but the bottom line is that it has the classic Yamaha horns, woodwinds and guitars that sound so realistic, I still record with them. 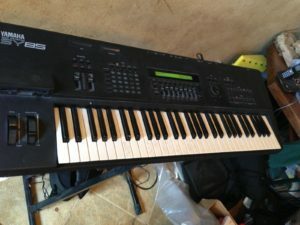 “This SY85 is in perfect working and very good condition!! The belt of floppy disk drive was changed to the new. 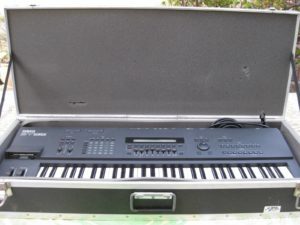 “YAMAHA SY85 SYNTH KEYBOARD WITH TRAVEL CASE. This item was recently picked up as Surplus. 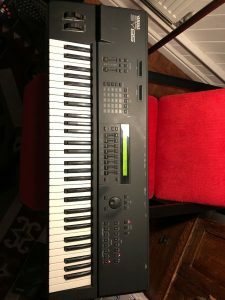 It has been tested for power and does power on, system lights up, LED screen displays correctly but unfortunately due to lack of knowledge and equipment I am unable to fully test it, therefore , this item is BEING SOLD AS IS FOR PARTS OR REPAIR. As shown in the photos, this item is in great condition. All keys are straight and respond with good action. Please zoom in and view photos carefully for further details. 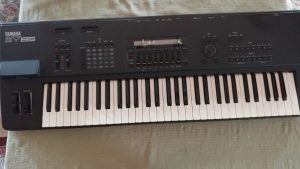 “Classic Yamaha SY85 Music Synthesizer with sample memory expansion installed. There are a few light scuffs here and there and a spot of age-related discolouration on the keys, etc., but the instrument is otherwise in very good condition. The synthesizer itself works perfectly but the disk drive requires some attention because it is currently not reading floppy disks and displays the “disk not ready” error. The disk drive motor works and I have already replaced the drive belt but that has not solved the problem. 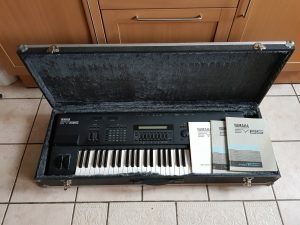 “Yamaha SY85 Classic 90s synth/workstation. It’s been sat on a shelf in a padded gig bag for 10 over years. 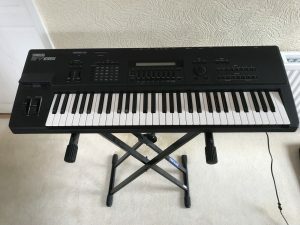 “This Ebay listing is for a Yamaha SY85 Synthesiser Workstation. I acquired this second hand as part of a project I was working on which is now complete and this synth is now surplus to my needs. It all seems to be working as it should with the exception of the floppy drive which I believe is a common fault with these – this does not seems to effect the operation of the synth though. I have been led to believe you can data dump via MIDI to save data but I have not tried this. It does have signs of wear and tear especially on the bottom and the lower back of the rear panel where it has been taken on and off stands etc. All the keys are working fine with no signs of breakages or cracks etc. ” For sale is the classic SY85 workstation keyboard from the early 90’s, everything works as it should except for the floppy disk drive. The keys are clean and have a very good action. 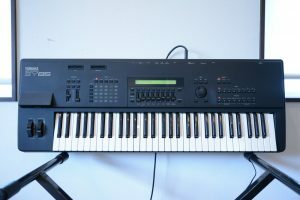 Back in the day this keyboard was in the top 5 along side the Roland D50 and the Korg M1 sharing a lot of components with the Korg, as at the time Yamaha owned Korg, most notably is that they use the same keypad, that alone justifies using this as a controller as it has a far superior action to the modern day controller keyboards. The SY85 has a more powerful sequencer than the Korg and is easier to edit with the addition of the faders and wheel. The disk drive does not work but everything can still be saved and loaded via midi and as this can be plugged into any Daw it is not really an issue. It has great sounds and the onboard effects are very good, touch sensitive keys as well as having aftertouch. 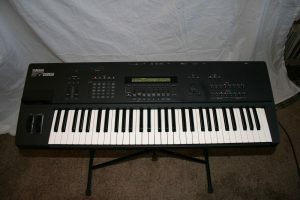 Yamaha SY85 SY-85 Music Synthesizer Workstation. Used but in good working condition. Tested through my little guitar amp Ana got plenty of sounds (sorry, I’m NOT keyboard guy). It’s quite advance for a simpleton like me. Appears to work properly except for one sticky key. Might be an easy fix for someone more skilled then a noob like me. Has slots for various upgrades and additional sound patches. “Used, in great condition for it’s age. Everything is in perfect working condition including the floppy drive. “Hello, and thank you for visiting my listing. 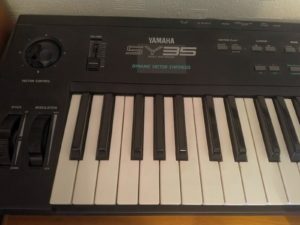 You’re looking at a Yamaha SY85 in mint condition. Every aspect of this keyboard is in full, working condition. 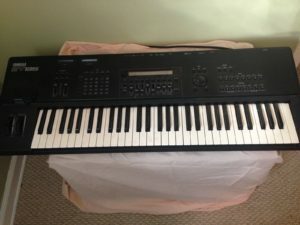 ” Yamaha SY85 in great condition. 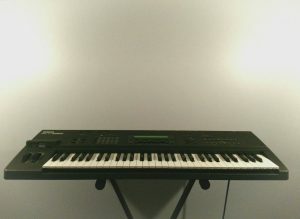 A classic synth workstation which I’m sad to have to sell. Won’t list the specs because they’re easily googled. Keys and controls all in perfect working order. Just tested the disk drive after not using it for years and it’s faulty – a motor whirrs but nothing is read. I’m sure the drive could be replaced if you wanted to. Or just manage your sounds and edits over MIDI if the internal storage isn’t sufficient.